EZ Strip Quick Kit is the all in one quick clean up kit for tough messes. Our advanced non-toxic formula can be used fast and effectively on virtually all surfaces. Use the included EZ Strip All Purpose Remover to remove all types of paint spill & overspray, graffiti, decals, markers & ink, gum, adhesive & glue residues, tree pitch, stickers, bugs & tar, and just tough sticky stuff. Gets the dirty jobs done! Duck All Purpose Duct Tape, Silver, 1.88 inch x 45 yds. All Purpose Duck Tape Brand Duct Tape is the all-around tool for temporary repairs and quick fixes around the house, garden or garage. With its high adhesion and easy-to-tear application, this workbench favorite is great for holding, seaming, sealing and bundling. Its strength and conformability makes this tape ideal for those difficult DIY or construction projects that involve corners, bends and curves. All Purpose grade tape is ideal for use on a wide variety of repairs or fixes around the home, office or school. Painters Mate Double-Sided Poly-Hanging Tape is an all-in-one solution for hanging poly-sheeting that is cost- and time-efficient. Each roll is designed with a unique, double-sided adhesive system: the exposed side features a premium grade painter's tape adhesive that allows for 21-day clean removal from a variety of surfaces; removing the liner exposes an aggressive adhesive that securely holds poly-sheeting, plastic drop cloths, tarps, and other protective coverings. and other protective coverings. Great when prepping for remodelling and renovations task like painting, cleaning, sanding and more. Over time, nature's elements can damage wood and concrete or stone surfaces around the home. Recochem's Linseed Oil is the ideal solution to easily protect your investment with a long lasting protective seal. Linseed oil penetrates deep into the wood and creates a water and alcohol resistant surface without altering the natural colour of the wood when dry. When applied to a porous surface, linseed oil fills the pores and, as it is exposed to air, gels to form a protective film. Our Boiled Linseed Oil is treated with effective drying agents, which ensures quick drying time and reduces the possibility of a sticky finish. 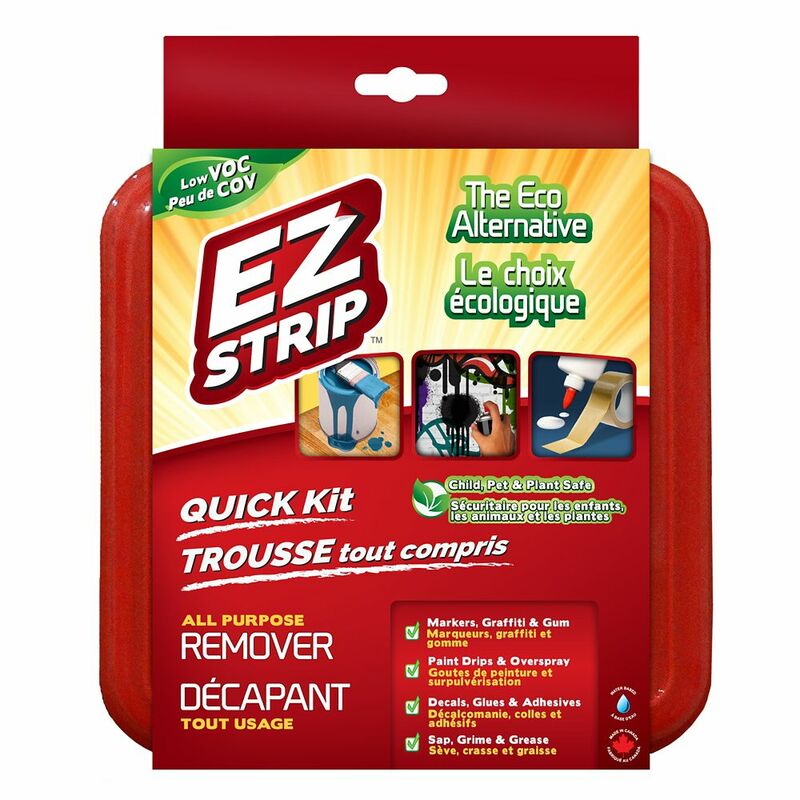 EZ Strip Quick Kit EZ Strip Quick Kit is the all in one quick clean up kit for tough messes. Our advanced non-toxic formula can be used fast and effectively on virtually all surfaces. Use the included EZ Strip All Purpose Remover to remove all types of paint spill & overspray, graffiti, decals, markers & ink, gum, adhesive & glue residues, tree pitch, stickers, bugs & tar, and just tough sticky stuff. Gets the dirty jobs done!